My tryst with cooking happened out of necessity. When I moved out from my home city due to job requirement I had to rely on tiffin services for my daily survival. I soon figured out, in the long run, tiffin services couldn’t be relied upon. Food from any tiffin service that seemed so delicious and wonderful during the first week would begin to taste bland and insipid by the end of first week. It was then I understood the significance of cooking and began taking it seriously. During the initial years, when I had surpassed the beginners level and was attempting to graduate into intermediate levels of cooking, I began attempting dishes made from Chicken, Eggs and mutton and figured out that handling it was relatively easier than seafood. Being a Konkani, this fact was a bitter pill to swallow. I recall having a conversation with my Mother over the telephone in which I admitted my fear of cooking seafood and how I felt cooking seafood was very elusive. I faced difficulty on two fronts- purchasing fresh fish and then handling and cooking fish. I lacked confidence at both these fronts. My mother cajoled me into thinking how taking small risks and embracing failures could help in overcoming them and it shouldn’t act as a deterrent in my cooking adventures. Bearing her words in mind, I began with seafood again with cooking prawns. Fortunately, it was successful attempt! Fish curries are equally loved with fried fish in my home. Then I tried my hands on round fishes like mackerel, seer fish and Pomfret cooked in coconut based gravies, flavored with spices, and balanced with just right sourness. In the beginning I ended up overcooking fish resulting into its disintegration. For my reader’s benefit who have just ventured into cooking, let me mention about a dichotomy- mutton or chicken falling off the bone, are sometimes considered to be a delight and can please many but a fish cooked to similar levels is a cardinal sin. It should never fall of the bone (an error that I would commit in the initial years) and if it does, you have overcooked it and you would end up angering many. I think when you learn from your mistakes, the learning are etched in your memories forever and you do not repeat those mistakes in future. 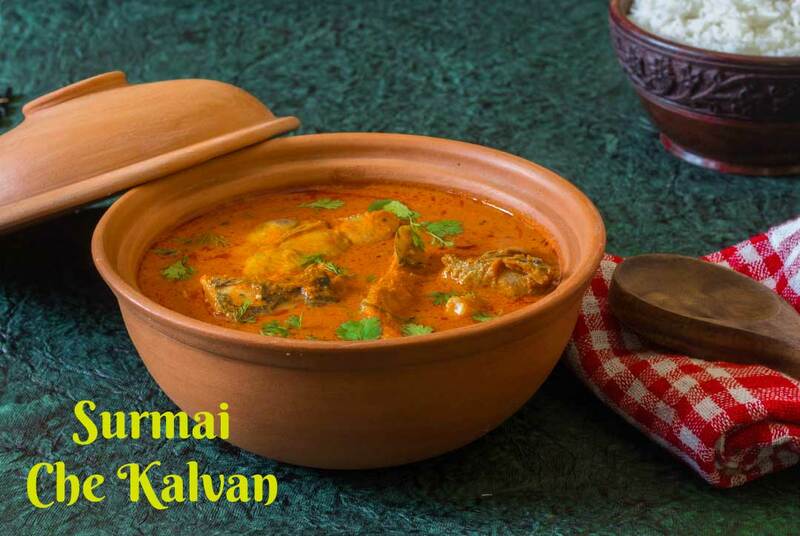 Today’s recipe of Surmai Kalvan or Surmai Gravy preparation is my heirloom recipe. A unique quality of this recipe is the usage of fennel seeds in masala paste. I remember quizzing my Mom on numerous occasion why do we need to add fennel seeds to a Konkani gravy and the only answer that she could manage was “it just tastes good”. Later when I went to pursue my Post Graduation in Culinary arts the mystery became clear to me. In the classes of ‘Global Cuisine’ while we were discussing about various classic combinations of ingredients, our professor educated us that fennel pairs up beautifully with fish and then suddenly all those years of practical learning began to make sense. I proudly told my professor that I was aware of the practical usage of this combination and how we use fennel in our Konkani Cuisine in fish curries. Surmai Kalvan, a typical Konkani Seer fish dish that is quite a regular in a Konkani household and forms part of our comfort meal when accompanied with steamed rice. Do try it and share your feedback in comment section below. To start with, we have cut Seer Fish in large pieces. I like to use few pieces like fish head in my curry. Though these pieces are not as fleshy as others, it makes curry more flavorful and delicious. Put turmeric powder and salt. Coat well with fish slices. Keep fish slices aside for 15 mins. Meanwhile, we will make a masala paste. In a grinder jar put dry red chilies, Ginger-Garlic, Whole Coriander Seeds, Fennel Seeds, Onions, Tomatoes, dry red chili powder, grated coconut, water and grind into a fine paste. We have used ¾th Cup water while grinding masala paste. Heat 3-4 tbsp Cooking Oil in a pan. Put Mustard Seeds and allow it to splutter. Add Curry Leaves and Masala Paste and mix well. Cover and cook the masala on low heat. Remember to stir the masala intermittently. We have cooked Masala on low heat for 10 mins. Oil begins to ooze out from Masala paste. Now, add marinated fish to curry. Fish meat is very delicate, so give a gentle stir. Cover and Cook on low heat. We have cooked on low heat for 4 mins. Uncover now and give a gentle stir. Tip: a) Medicinal properties of Turmeric Powder are well known. Turmeric has disinfectant and anti-bacterial properties. Always marinate the meat (fish, mutton, chicken) with turmeric powder. This will eliminate the bacterial growth in meat. b) Many times, we just store coriander leaves but discard its stems. These stems provide a different flavor and aroma to the dish. You can add chopped stems to soups, gravy preparations and chicken stock. New recipe , I have heard first time about this. Fantastic recipe. Just by reading it tells you how it will taste. Smita dear, all your recipes are outstanding and close to my heart. Thank you for that. Can I ask you a favor that if you could post खेंगट recipe where you get mixed of fresh small fish like मांदेली, ओले बोंबील, आणि करंदी (golden tail netilli fish, fresh bombay ducks, and fresh baby shrimps)? I just got the frozen package of this mixed fish in a Bangladeshi grocery store in New York for the first time after living here more than 45 years. I really appreciate it if you could post it earlier. Thank you. Dear Smita, I have already noted down the bombil Kalvan recipe. Mind you I have read all your recipes over and over with great interest and for another reason to find the fish khengat recipe that I asked you about in my earlier comment to you. Please do post it at your earliest. Thank you. Keep posting your great recipes. Sure Tai, Your comment made my day 🙂 I will surely post fish khengat recipe for you as this is my household recipe :-). Kindly allow me some time as there are some personal and professional commitments lined up in my queue 🙂 Thanks once again ! Take your time Smita, there is no such rush. The frozen stuff is already put away into my freezer until I get the Khengat recipe from you. Thank you.